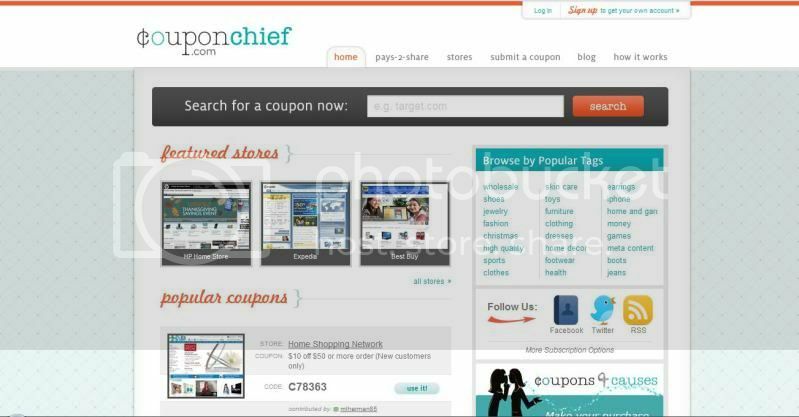 Hey guys I'm going to be reviewing a site that I have recently come across called ‘Coupon Chief’. Coupon Chief has the largest source of online coupons and store discounts for apparel, electronics, travel, entertainment and more. Coupon Chief is one of the fastest growing coupon sites, with over 250k visitors/month. We have over 50k coupons for over 15000 stores, giving us one of the largest databases of online coupons on the net. Basically, it is a site where you can find coupon codes, discount codes and codes for freebies for various online stores. It is really simple to navigate and you can easily find these coupons by typing in shop in the search bar. If you’re unsure about the name of an online store, it’s not a problem because you can browse by categories instead. Also, you can submit coupons that you have read, seen or heard about to allow other people to use them J You may also get commission for each time your submitted coupon has been used! This would be ideal for people who have their own online store and would like to have more exposure. Two particular online stores that have coupons that I could use are Strawberrynet.com coupons and CherryCulture.com coupons since I’m such a make-up addict! I actually have never purchased from these sites before so maybe having these coupons available will encourage me to shop at these stores. 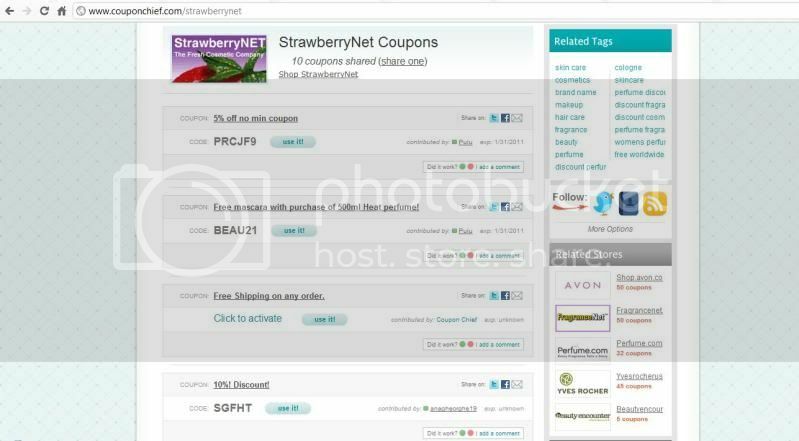 Strawberrynet.com seems to have some really good coupons and codes like free shipping and 10% discounts which can help if you buy a lot from the store in one transaction. CherryCulture.com has one code available for use which is 25% off everything with a code to use at the checkout. If only Cherry Culture had more codes that were available but hey, I really can’t complain! Have you seen the prices of their things? Very inexpensive! Definitely looking forward to my first purchases from CherryCulture. So next time you’re thinking of doing some online shopping, I suggest that you check out Couponchief.com and you never know, the codes might work and perhaps it’s possible to use multiple codes. Anyway, I’d love to know whether you’ve tried any coupons or discount codes from Coupon Chief, or if you’re thinking of using them the next time you online shop =] You know I will! niceeeeee, will save a bit money =p they don't have these kind of sites here =/ too bad..
oh that website is great. thanks for sharing with us! Thanks for sharing this link ! I rarely buy when there's no sale/coupons ;-b Cause' even if one doesn't, surely another one will ! Would totally check this web site! Thanks For blog with beneficial informations. I love Coupon Chief, great savings! Saved 50% on clothing at Old Navy. Would definitely use this site again!